RakworX Metered rack Power Distribution Units (PDUs) provide real-time remote monitoring of connected loads. User-defined alarms warn of potential circuit overloads before critical IT failures occur. 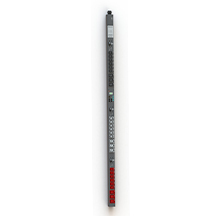 AP5000 series Metered Rack PDUs include real power monitoring, a temperature/humidity sensor port, locking IEC receptacles, and ultra-low profile circuit breakers. Users can access and configure Metered Rack PDUs through secure Web, SNMP, or Telnet Interfaces. Distribution Units (PDUs) provide real-time remote monitoring of connected loads. User-defined alarms warn of potential circuit overloads before critical IT failures occur. Do not require additional tools to mount into RakworX which allows the users to quickly and easily mount units to the rack. Can be mounted vertically, horizontal. Supply power from one branch whip to multiple pieces of equipment, conveniently powering rack-mount equipment. Having a variety of inputs and outputs allow users to adapt to various power requirements. Provide a number of outlets to bring power to rack equipment at an competitive price. Define alarm thresholds to avoid overloaded circuits. Informing the user of possible problems. Include real power monitoring, a temperature/humidity sensor port, locking IEC receptacles and ultra-low profile circuit breakers. Indicate the overload and alarm information on the LED / digital display helps installers avoid overloaded circuits by providing a visible warming.